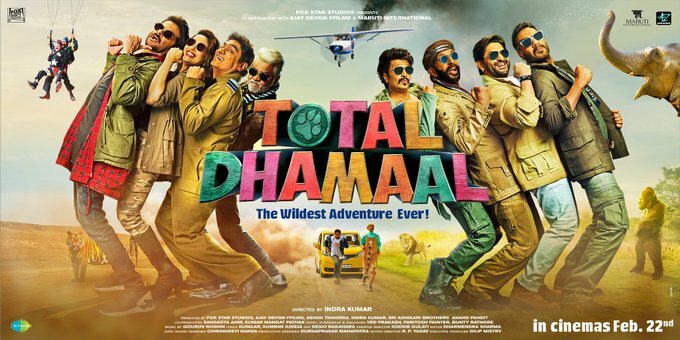 The Trailer of the much-awaited super comedy film 'Total Dhamaal' is out and loved by the audience. The trailer is very outstanding and full of adventure, comedy, and thrill. The adventure comedy film is directed and co-produced by Indra Kumar and it is a third addition of the Dhamaal film series. The film stars Ajay Devgn, Riteish Deshmukh, Arshad Warsi, Javed Jaffrey, Madhuri Dixit, Esha Gupta, and Anil Kapoor. Total Dhamaal is about a treasure hunt of sorts. The characters are part into the group in pursuit of a huge amount of treasure which is hidden someplace in a place called Janakpur. Ajay Devgn and Sanjay Mishra appear to be in one group, while yesteryear hit Jodi Anil Kapoor and Madhuri Dixit shape a group. Keeping in a state of harmony with the past movies, Arshad Warsi and Javed Jaffery are additionally one group. Unexpectedly, the characters will have a ton of experiences with wild creatures in the film, as can be found in the trailer.The film is scheduled to be released on 22 February 2019.